Interior design is taking on new dimensions within senior living communities. No longer just aesthetic in nature, décor has multiple purposes in helping residents orient themselves, find their way and feel good overall. It is this new approach to design that Aspired Living of Westmont, IL, revealed to the crowd of visitors who attended the community’s open house on Sept. 28. The 107- unit assisted living and memory care property is also the first senior living community in the United States to provide residents with Spark of Life, a treatment and support program for dementia care. 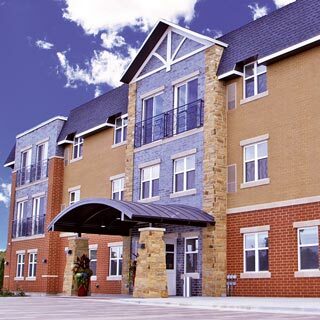 Set on an approximately threeacre site, Aspired Living of Westmont offers 73 independent and assisted living apartments ranging in size from 400 to 1,180 square feet. Each unit features a kitchen with stainless steel appliances, private bathrooms with walk-in showers, closet space and Juliet balconies. The memory care segment, called A Knew Day, includes 34 studios, each with a private bathroom. The interiors were created by senior living design firm ThomaHolec Design. Keith Stanton, director of design development, says his main objective was to use all facets of décor — including lighting, color, flooring and fabric — to radiate warmth and stimulate senses. Little details are important, he says, such as commercial fabrics stirring tactile senses, whereas wider hallways and no reflective surfaces help memory care residents feel more comfortable navigating the corridors. Line-of-sight layouts help with wayfinding, balance and orientation, he added. Wall art also serves as an orientation cue for residents. In assisted living, each neighborhood is distinguished by a theme — one hallway features different representations of dogs, whereas another features an array of fish and another a series of birds. Memory care adds a palette of pastel colors to its sections so residents can find their units easily. The community features a long list of amenities, including a restaurant and bistro, resident lounge with demonstration kitchen, cocktail lounge and bar, library, technology center, movie theater, art studio, salon and spa. Residents also have access to fitness options, including a yoga studio, gym with personal trainers, high-tech pneumatic exercise equipment and outdoor walking paths. An on-site therapy gym offers physical, occupational and speech therapy. Enrichment programs are at the heart of the community’s approach to resident fulfillment. The organization’s VIVA! philosophy is designed to enhance residents through various social, educational and recreational pursuits.